Mary Helen Stefaniak’s novel, The Cailiffs of Baghdad, Georgia (W. W. Norton), received the 2011 Anisfield-Wolf Book Award for Fiction. 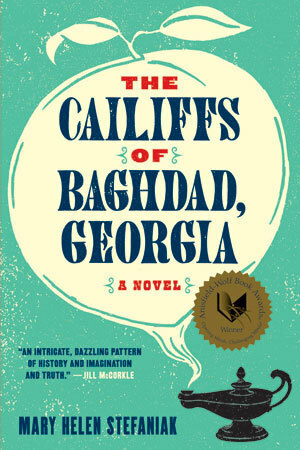 For 83 years, the Anisfield-Wolf Book Awards have recognized books that “make important contributions to our understanding of racism and our appreciation of the rich diversity of human cultures.” Juror Rita Dove described the novel as “a rollicking tale that manages to speak seriously to the tragedy of ignorance and the damage caused by fear. The Cailiffs of Baghdad, Georgia was also selected by independent booksellers as an Indie-Next “Great Read." Stefaniak's first novel, The Turk and My Mother (W. W. Norton), received the 2005 John Gardner Fiction Book Award from Binghamton University and was recognized by the Wisconsin Library Association for Outstanding Literary Achievement. It has been translated into seven languages. Her collection of short fiction, Self Storage and Other Stories (New Rivers Press), received the Wisconsin Library Association's 1998 Banta Award for Literary Excellence, and her novella, "The Turk and My Mother" (EPOCH, Fall 2000) was shortlisted for the O. Henry Prize. Mary Helen Stefaniak is a writer of fiction and essays whose work has appeared in many publications, including The Iowa Review, EPOCH, Short Story, The Yale Review, AGNI, and The Antioch Review, and in several anthologies, including New Stories from the South: The Year's Best 2000 & 2006 (Algonquin Books) and A Different Plain (University of Nebraska Press). She has also served as a commentator on Iowa Public Radio, a columnist for The Iowa Source, and a contributing editor for The Iowa Review and for Cerise Press, an online journal of art and literature. She has presented writing workshops, book discussions, and readings at bookstores, libraries, universities, and other venues from Florida to Alaska. She's enjoyed visits with many book clubs and community groups--including readers of Il Turco di Mia Madre (Einaudi, 2007) in Fiera di Primiero, Italy. Stefaniak is a graduate of Marquette University and the Iowa Writers' Workshop. She teaches in the M.F.A. program at Pacific University in Oregon and in the International Summer School at Renmin University in Beijing, China. Stefaniak, a native of Milwaukee, grew up in a bicultural household: her father was born in Milwaukee, Wisconsin; her mother in Gordon, Georgia. She divides her time between Iowa City, where she and her husband John live in a 160-year-old stagecoach inn they restored, and Omaha, where she is Professor Emerita of English and Creative Writing at Creighton University.